Medical professionals are still unsure about whether or not this is a wise tactic. 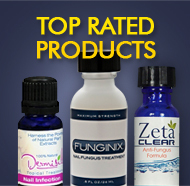 How to know which nail fungus treatment to use often depends on the stage of the infection and other factors. Some situations where the nail is exceedingly infected and has already started to separate from the area attached to the cuticle call for the removal of the nail. But this is not a procedure that a nail fungus sufferer should take on without a podiatrist. If there is only a white patch on the nail, a strong, effective topical nail fungus cure should eliminate the infection. If there is nail thickening, brittleness, separation and inflammation, topical solutions are still effective but there may need to be an oral supplement of some kind to increase the medicinal dosage. The usual discoloration of the toenail is a yellowish brown hue. If there are other organisms causing the change in the toenail, the discoloration may take on a dark green to black appearance. Black toenail can also be caused by trauma, autoimmune disorders, and melanoma. If the infected nail is in this advanced condition, it is very important to consult a medical professional to determine the proper course of action. It is obviously very important to arrive at the right diagnosis before treatment or sufferers will simply be wasting their time and money. Removing the toenail completely is not recommended for some individuals since the risk of complications, improper healing and/or infection is high. We would highly recommend that a patient go to a doctor or podiatrist to manage the trimming and, if necessary, the removal of the nail infected with nail fungus. Reasons for removal include: if leaving the toenail will cause further complication, if the toenail is already partially separated from the cuticle bed and if simply trimming the infected nail does not achieve the desired result. Keep your feet dry but not excessively dry. Use lotion to prevent excessive dryness, but do not use it between your toes. Be vigilant about careful drying after bathing or physical activity, or when you are in a warm humid environment. To help keep feet dry, you may use either regular or antifungal talc. Wear socks made of “breathing” fabric, which keep moisture off the skin. Make sure you examine your feet daily for minor skin breaks, rashes, and nail changes. Keep your shoes in a cool dry place. Because any trauma to the toes increases the chance of fungal infection, wear well-fitting shoes and seamless soft socks. Keep your toenails trimmed straight across and not too short. Clean your tub with bleach and use shower shoes when in a public gym or swimming pool to avoid potential nail fungus breeding ground. This entry was posted on Wednesday, March 13th, 2013 at 8:33 pm and is filed under Causes of Nail Fungus, Good Nail Care Habits, Nail Fungus Symptoms, Toenail Fungus Treatments. You can follow any responses to this entry through the RSS 2.0 feed. You can leave a response, or trackback from your own site.